Have you ever been in a situation where you want to extend a local network (or maybe an Internet connection) from one building to another that’s separated by some distance, say anywhere from several feet to a few hundred feet? Many people use wireless in this situation, and that’s a perfectly acceptable solution if it works, but it also brings with it a host of security issues. Any signal that is put into the airwaves is one that can potentially be intercepted, particularly if you’re not really familiar with wireless security. I’m not saying you should or should not use wireless, but I do know that some folks aren’t crazy about the idea. Also, there are distance limits on wireless links that can mean that no useable signal will be available where you want it. Unfortunately, the only alternative to a wireless link between buildings is a physical link (if you ignore more esoteric alternatives that depend on both buildings getting their electrical service from the same power transformer) and there you have two choices, copper or fiber. Assuming you are going to bury a line between the two buildings, how do you know which to use? I know there are people who would never recommend copper under any circumstances. The reason is that during electrical storms, there can be a difference in electrical potential between two buildings. This can cause serious amounts of current to flow, especially if lightning strikes nearby, damaging equipment (and in an extreme case, possibly even starting a fire). Even in cases where the equipment at the endpoints doesn’t seem damaged, the connection can turn very flakey after a lightning strike, with very high packet loss. The only situation where you might get away with running underground Cat5e (or Cat 6, if you can find it) is to a very nearby building, and then only if you put very good approved lightning protection at both ends of the cable. The further away the building, the more important that the lightning protectors become (and if the buildings get electrical power from different sources, such as different electrical transformers, then the lightning protection becomes even more essential), and of course good lightning protection costs money. And even then, if lightning hits very close, it can fry the lightning protectors, meaning the Internet connection will likely be out of service until you can obtain and install replacement protectors. One other problem to note: You have probably heard that the theoretical maximum distance for a run of Cat5e/6 cable on a wired network is 100 meters. That may be true indoors, in a dry environment. It’s not always true when the cable runs underground and/or is partially exposed to outdoor climatic conditions. On a run that’s close to the theoretical maximum in length, you may find that a connection that works beautifully during the cold winter months suddenly starts showing high packet loss during the heat and humidity of summer. 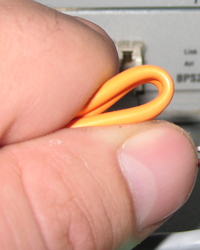 The alternative to Cat 5e/6 cable is fiber optic cable. Fiber is a great alternative because it uses glass fibers rather than copper wire to carry the signals. Since glass doesn’t conduct electricity, the only way lightning could ever affect it is in a direct strike, where it heats the ground so hot that the glass melts (this actually occasionally happens in areas with sand dunes, where the lightning creates glass sculptures by melting the sand into glass, but it’s very unlikely to happen on regular flat land). The trouble with trying to use fiber is that just about everyone with any networking experience knows how to use Cat 5e or Cat 6 — you just plug it in to your equipment at each end, or if it doesn’t have plugs then you either use a tool to attach them, or your bring the wire to a modular jack and use a punchdown tool to make the connections (some lightning protectors have punchdown terminals as well). You can cut the cat 5e or 6 cable to the exact length you need. It’s something many people are familiar with, whereas fiber may as well have been pulled out of an alien spacecraft for all anyone (outside of those in the telecommunications industry) seems to know about it. If you go searching for pages on the Internet explaining how to install a fiber link between two buildings, good luck in finding anything useful! Part of the probable reason there aren’t too many general how-tos on the subject is that there are so many variables — there are many types of fiber available, each of which is good for certain specific uses, with many different types of end connectors. And then you need equipment at each end to connect the fiber to the wired network, and you can’t just run down to the local office supply or big box electronics store to find that. But don’t despair, because I’m going to tell you one way to set up a short range fiber optic link. The caveat here is that I am by no means an expert on this — I’ve been involved in an installation ONCE, but I learned a lot in the process. Still, if you have questions that aren’t answered on this page, I’m probably not the guy to ask. But I figure that if you’re searching for online information on the subject, any information is better than none! You can’t cut and splice fiber (unless you buy some really expen$ive supplies and equipment, and learn how to use them). You buy the length you need, with the connectors at each end already attached. If it’s too long, you coil up the excess (not TOO tightly) but you never cut it nor try to splice it, unless you have the specialized equipment that allows you to do so. At each end, the fiber plugs into a device called a media converter. The media converter (or the SFP module that plugs into the converter — more on that in a moment) contains a laser, and a receiver. It transmits on one fiber of a pair, and receives on the other. The one thing you must never do, if you value your eyesight, is look into the laser while the unit is operating. That also means you can’t plug a fiber cable into the media converter, then look into the other end of the fiber to see if it’s working. If you think you might forget this important safety precaution, just try to remember that not looking into the laser is as important as not touching a live electrical line — and if that doesn’t scare you, take a course in reading Braille, because you’re probably going to need it. It’s also possible to buy gigabit switches that can directly accept fiber. This eliminates the need for a separate media converter at one or both ends, but such switches tend to be a bit on the expensive side, although they also tend to offer more ports than most typical home switches (24 ports, for example). But there is sometimes a cost in terms of power consumption – for whatever reason, standalone media converters often tend to draw far less power than switches that have fiber ports. Fiber is somewhat fragile, and it can break (and be rendered useless) if it is subjected to too much strain. You can’t just pull it over a very long length without taping it to something else (that you’ll also be pulling) at regular intervals to relieve the strain. You can buy special, relatively inexpensive network pull string for the purpose, or if you don’t have any of that you can use any high tensile strength string (not twine, it breaks too easily, and avoid stretchy string because that sort of defeats the purpose – you want the string to help pull the fiber, not the other way around). The fiber I’ve seen needs to be inside something to protect it (no direct burial) – you can use cheap irrigation pipe for the purpose, as long as it’s large enough for the connectors at the ends to pull through (don’t try to be thrifty and undersize the pipe, but at the same time realize that fiber with the small LC connectors has plenty of room inside a standard one inch irrigation pipe, assuming you’re not pulling several multiple fiber pairs or other wires and cables). Also, you should use pulling lubricant on long pulls to prevent damage to the fiber jacket. When you buy the fiber, it will have connectors attached at each end (at least it had better have, if you want to actually use it — don’t buy bulk cable that doesn’t have the connectors attached!). These connectors usually have two-letter designations. Popular types are LC (the smallest you’re likely to encounter, which makes it very popular these days), SC, and ST. The media converter (or switch) has to be able to accept the type of connectors your cable has. If your media converter has an ST connector and the cable has LC connectors, you’re out of luck. Sometimes you can buy cable with different connectors on each end, so be careful that it matches your media converters. If you want to know more about fiber on a technical level, see the Reference Guide To Fiber Optics. A gigabit interface converter (GBIC) is a standard for transceivers, commonly used with Gigabit Ethernet and fibre channel. By offering a standard, hot swappable electrical interface, one gigabit ethernet port can support a wide range of physical media, from copper to long-wave single-mode optical fiber, at lengths of hundreds of kilometers. The appeal of the GBIC standard in networking equipment, as opposed to fixed physical interface configurations, is its flexibility. Where multiple different optical technologies are in use, an administrator can purchase GBICs as needed, not in advance, and they can be the specific type needed for each link. This lowers the cost of the base system and gives the administrator far more flexibility. On the other hand if it is known that a switch will mostly have one port type (especially if that port type is copper) purchasing a switch with that port type built in will probably be cheaper and take up less space per port. The GBIC standard is non-proprietary and is defined by the SFF Committee in document # SFF-8053i. 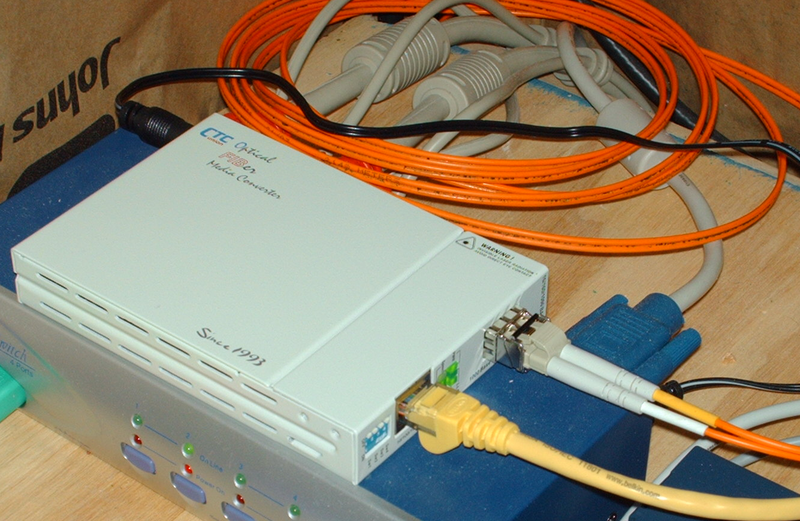 A variation of the GBIC called the mini-GBIC or SFP exists as well. It has the same functionality / modularity but in a smaller form factor. The small form-factor pluggable (SFP) is a compact, hot-pluggable transceiver used for both telecommunication and data communications applications. It interfaces a network device mother board (for a switch, router, media converter or similar device) to a fiber optic or copper networking cable. It is a popular industry format supported by several network component vendors. Okay, in case you weren’t following along, a mini-GBIC, also known as a SFP, is a module that plugs into a media converter or a compatible switch. What this means to you is that you can buy a media converter, then plug in the SFP that matches the type of fiber and connectors that you have. So let’s say you have fiber with LC connectors – you get a SFP with LC connectors to match. Now suppose that at some point you need to replace that fiber with some that has ST connectors – you don’t have to throw out the entire media converter or switch, but instead you just get a new SFP. Not all media converters accept SFP’s, but many of the newer ones do. Also, not every manufacturer’s SFP will work with every media converter – if you buy an SFP you have to make sure it’s compatible with the media converter (or switch) that you own. If you go the SFP route, you have to make sure of three things: That the connectors match the connectors on your fiber cable, that it’s intended for use with multimode rather than single-mode fiber, and that it’s for intermediate or short reach use (IR or SR — you may also find the designation SX or 1000Base-SX used to indicate a short to intermediate range SFP). In particular, you don’t want one with long reach optics because unless you use fiber attenuators you’ll overload and probably burn out the receiver at the other end (also, there’s a much greater chance of eye damage if you accidentally glance at the laser). To give you an idea of the difference, the short range optics are generally specified for runs up to a few hundred meters in length, while long range optics have distances specified in kilometers (sometimes as much as 80 km or more!). So lets say that you want to run a fiber optic cable between two buildings that are a reasonably short distance apart — what do you need? The first thing you need is a pipe or conduit of some kind between the two buildings. Irrigation pipe (the stuff you find at any home improvement store, or anyplace that sells underground lawn sprinkling supplies) is fine – remember you aren’t running anything electrical if all you are running is a fiber cable! The main thing is that the pipe or conduit that you use should be relatively smooth inside to minimize pulling resistance. Try to keep bends in the pipe to an absolute minimum. And yes, the pipe could be above ground as long as it’s sunlight resistant and not in a place subject to physical damage (but be aware that black pipe could get VERY hot in direct sunlight, so keep it out of the sun if at all possible). The purpose of the pipe or conduit is to protect the fiber. The pipe must be large enough for the connector (at the fiber cable’s end) to fit inside, with space to spare. If you have to splice sections of pipe together, the connectors may have a smaller inner diameter, so plan accordingly – you don’t want to get halfway through a pull and realize that the diameter at the splice point is too small to continue! This article isn’t about burying pipe, but I will just suggest that you think about routing it far away from anyplace that people might be digging in the future, if at all possible — and if that’s not possible, then consider burying it as deep as possible, to minimize risk of backhoe failure (or on a farm, of getting plowed up!). You need network pull string and electrical tape. 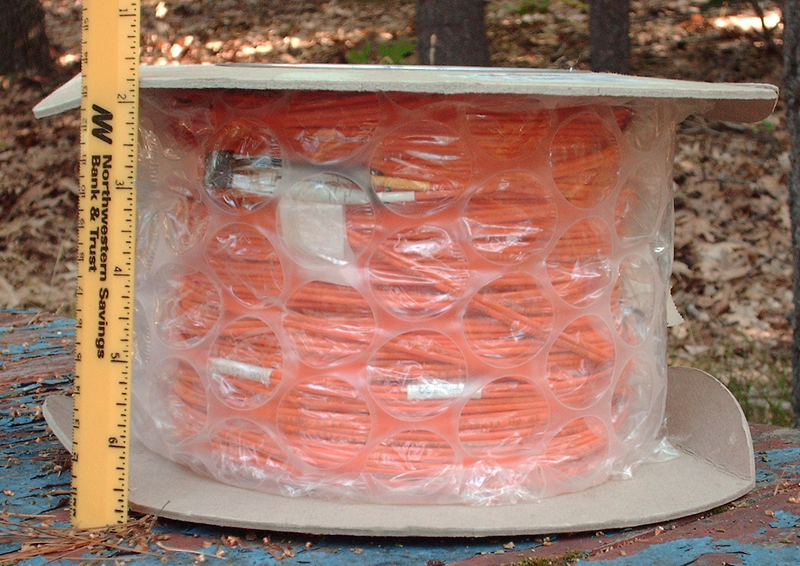 The string must be longer than the fiber cable – if it’s twice as long then you could pull just the string through the pipe to use for pulling (a good shop vac and a small wad of paper tied to the end of the string is often enough to get the string started through the pipe), and still have enough left on the far end to tape the fiber cable to the string for the entire length. Do that every few feet, making sure that there’s a little slack in the fiber (not too much) when the string is pulled tight. Be sure to tape the leading end of the fiber connector (with the protective cap on) firmly to the string so it can’t try to flip over or do something equally undesirable during the pull. Note that if you are also pulling any kind of wire through the pipe on the same pull, you could tape the fiber to the wire rather than a string, assuming the wire is strong enough to not stretch during the pull. You need pulling lubricant — any electrical supply store sells this stuff. But note that this stuff can dissolve the adhesive on electrical tape (we found this out the hard way), so when you tape the cable to the string, try not to leave the adhesive side exposed. The trouble is that to really do it right you should use plenty of pulling lubricant, yet at the same time if you do, if you taped carelessly then you may have issues with the tape not holding as it should. That’s not a reason to apply less lubricant, but rather a reason to use a little extra tape and to make your tape wraps nice and tight, so the lube can’t get between the layers of tape (especially at the very start of the pull). We used some blue gel stuff called Ideal Aqua-Gel II and used a paintbrush to apply it liberally to the fiber cable, after first using a funnel to dump some down the pipe. You can get a gallon pail of this stuff for between $15 and $20 at most electrical supply stores (the places the electricians shop), though you might wind up with another brand. We found that a gallon was really excessive, we could have easily got by with a quart of the stuff (on a 100-meter pull). On the other hand, it was much easier to dip a paint brush into the gallon pail, then slop it onto the fiber cable and down the pipe. You really don’t want to be stingy with it, since friction in the pipe can damage the fiber jacket. The fiber we used was described as “Advanced Interconnect 100 Meter LC-LC Duplex MultiMode Fiber Optic Cable. This Advanced Interconnect cable part number 038-001-964 REV A. Cable is 50/125 OFNP Micron Fiber.” It was obtained from eBay seller isellcables. If you are wondering what a dual LC connector looks like, there is a good photo here. 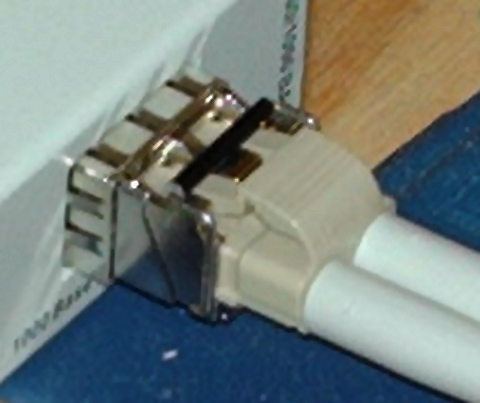 Note that the connector comes with a protective cap, which should be left in place during the pulling process. As it happened, this eBay sale included a LC SFP with each converter, so those didn’t have to be purchased separately. The seller on these was sales_fo4all. Below is an individual SFP in its packaging – you can’t see the model number but it’s SFM-7000-S85, which is described as a “1000Base-SX, multi-mode, 550m, 850nm SFP transceiver” and additionally, that “The capacity of SFM-7000-S85 module is 1.25Gbps (Gigabit rate). The transceiver extended range allows operation on either 50/125um or 62.5/125um multi-mode fiber for up to 550m distance. (Note: for 62.5/125um fiber, maximum operating distance is only 275m).” Since our cable was the 50/125 stuff, we could have gone a much greater distance (about 1800 feet) if necessary, and if we’d had a cable that long! In the picture below, the black part on the left is a small protective cap that is removed before you plug in the fiber cable. A better picture of a SFP module can be found here. 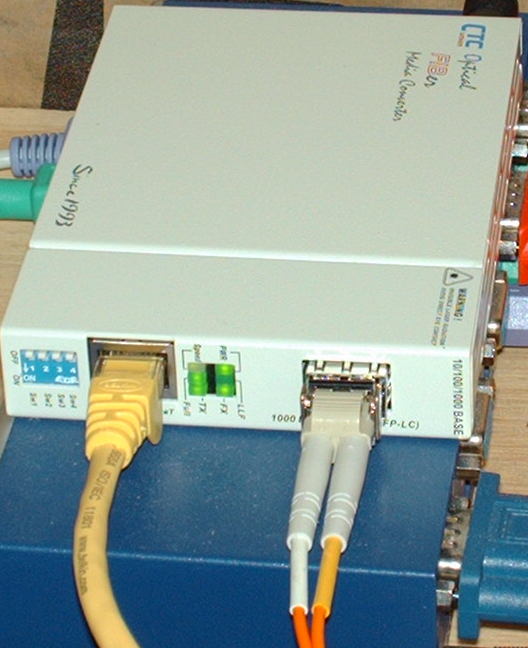 If you are observant, you may note that both the fiber converter and the SFP module shown above are made by the same company (CTC Union Technonlogies in this case). You may wonder, as I did, if you can use one manufacturer’s SFP with a different manufacturer’s media converter or SFP-compatible switch. According to Paul Timmins, “they’re theoretically universal but there’s absolutely nothing preventing them from vendor lockin (they’re active devices with internal serial numbers, etc, that help negotiate the capabilities of the optics with the device itself, and many vendors will refuse to work with another vendor’s GBIC/SFP).” I’m also told that a certain big name networking equipment manufacturer takes measures to prevent you from using competitor’s SFPs (which can often be overridden with undocumented commands). So if at all possible, when buying new equipment try to buy the media converter and SFP module as a matched set, or failing that, make sure that both the media converter and the SFP module come from the same manufacturer (unless there is some guarantee of compatibility, or the cost difference is great enough that you are willing to take the gamble that it will work). Then all you have to worry about is whether the SFP has the correct connectors to match your cable, and whether it’s the correct power level for the range you are using (again, don’t get anything that’s rated for use with cables of multiple kilometers in length, unless your cable really is that long!). After you pull the fiber cable, connecting everything up is fairly straightforward. The SFP plugs into the media converter or switch, and the fiber cable plugs into the SFP. You then simply connect the media converters to your existing network at both ends using a Cat 5e or Cat 6 patch cable. Then apply the power to the media converters at both ends (if you don’t apply the power until everything is plugged in, you can’t accidentally look into the laser!). If you happen to get the type of media converters shown above, you may notice that there are dip switches on the unit. There are for manually setting the port speed, and full or half duplex mode. We left these in the factory default position (all up, which is indicated as “UDP/NWAY” mode) and it works fine. Another thing you might wonder is whether you can connect a computer directly to the media converter at the distant end of the connection, and of course the answer is yes, though many people will prefer to connect a switch so that multiple devices can be used. And remember, you do have the option to buy a switch that accepts one or more SFP modules directly, which may mean you won’t need the standalone media converter at that end — but before you do, check the power requirements. As mentioned above, I found that such switches tended to be a bit power-hungry compared to the standalone media converters shown above. The upfront cost of running fiber is more expensive than using Cat 5e or Cat 6 underground, although if you add in the cost of good lightning protection at both ends (or replacing equipment that gets fried by lightning if you don’t use great lightning protection) then the cost difference is less significant. Today you can get 100 meters of fiber optic cable on eBay for about $80, including USPS Priority Mail shipping. The media converters and SFPs are still the expensive items — as I write this, they are going for $127 per set (media converter and SFP) on eBay, plus shipping. Add in the price of incidentals (pipe or conduit, pulling lubricant, network pull string) and you can expect to pay around $400 or perhaps a bit more for a 100-meter run (less if you can re-use existing pipe or conduit, more if you have to pay someone to dig a trench or otherwise run the cable through a difficult place). Of course you would have these same costs when running Cat 5e or Cat 6 underground, except for the media converters, so as a rough rule of thumb the price difference is the added price of the media converters and SFPs, minus the cost of the excellent lightning protection that you won’t need because fiber optic cable doesn’t conduct electricity. EDIT by TechNotes editor (October, 2014): It has taken years for prices to drop on these units but it appears the shift toward lower prices has finally begun. Amazon now sells some fiber media converters and SPF’s at significantly lower prices, for example you can get a TP-LINK MC220L Gigabit Media Converter, 1000Mbps RJ45 to 1000Mbps SFP slot supporting MiniGBIC modules, chassis mountable and a TP-LINK TL-SM311LM Gigabit SFP module, Multi-mode, MiniGBIC, LC interface, Up to 550/275m distance from Amazon for under $70 at the time of this edit. We have not tested this particular combination, but think it would work in the same way as the media converter and SPF shown above. I figure that in practice, the fiber install will cost an extra $150-$200 compared to an equivalent Cat 5e/Cat 6 install (again, we’re talking a 100-meter run here), but it will be worth it the next time you have an intense electrical storm nearby and realize that you’re probably not going to lose a lightning protector, computer, or router because of a surge coming in over the network cable. It will also be worth it if the run is long enough that every hot and humid day results in a degraded connection when using Cat 5e or Cat 6 underground. I do expect that the use of fiber will become more common in the future, since we will want ever-faster connections and there is a theoretical maximum on connection speed using copper. At some point, I expect the prices of fiber equipment to fall (the day they start selling it in the big office supply chain stores is the day you will see the price drop to more reasonable levels). But for now, the prices aren’t that unreasonable (especially compared to a few years ago). By the way, if you want to be the next millionaire, design a system that allows people to reliably attach their own connectors to bulk fiber cable, and that sells for under $100. It’s ridiculous that anyone should have to pay four-figure sums just to be able to attach ends to fiber cable. One other thing I think would help with fiber acceptance is to make an ultra-strong fiber cable that’s designed for difficult pulls – something with enough integral strength that you could pull the cable itself and not have to worry about breaking the glass fibers, and with a thick enough and tough enough jacket to withstand pulls over rough or uneven surfaces. Basically, fiber cable that could take a lot of abuse without breaking (not that the stuff we used is all that fragile, but still, it would be nice to not have to worry that it can be easily damaged, especially when you’re paying eighty bucks for a 100-meter roll). I want to thank Paul Timmins (the creator of the very useful TelcoData.us Telecommunications Database) for his help and patience in helping me understand all this stuff. This article could not have been written without his assistance. Also I want to thank my oldest son, who probably doesn’t want me to mention him by name, for his help and for letting me photograph some of the components in a recent installation. My purpose in writing this article was to try and help de-mystify some aspects of using fiber optic cable in place of Cat 5e/6 for runs between nearby buildings. Again, I am NOT an expert in this, and I may have left some questions unanswered. If you have questions or need clarification on some point, or if you see where I’ve made a glaring error, feel free to leave a comment. If I don’t respond, it probably means that I don’t know the answer, but maybe someone else with more expertise than I will chime in and help.